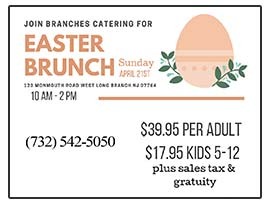 Long Branch — A tree grows in Long Branch. Actually, two trees, with the suggestion of many more, grow in Jessica Parks’s clever set, creating an apple orchard in rural Oregon. Lissie Fogerty (Kersti Bryan), a pretty woman in (as we learn) her early thirties, is on a ladder picking apples when she is startled by a visit from Billy (Christopher M. Smith), her attractive, slightly older neighbor. Aside from her father’s funeral earlier that day, this is the first time Lissie and Billy have seen each other in twenty years. Clearly, there are secrets to be revealed. Judging by the abrupt disappearance of Lissie and her brother Roger (Richard Kent Green) in their teens, those secrets are dark. Ostensibly, Billy is there to negotiate the purchase of the Forgerty orchard from Lissie, her father’s sole heir, but there is obvious chemistry and history between the self-conscious pair. 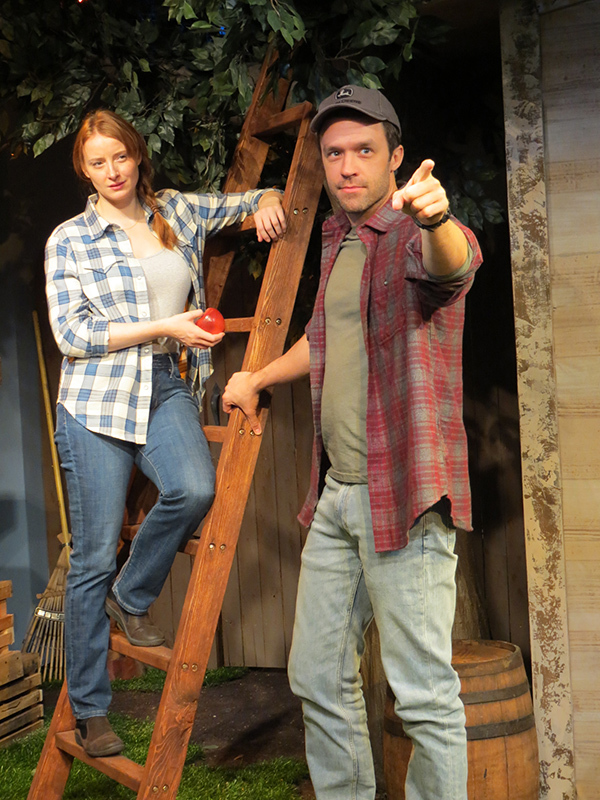 Apple Season, written by E. M. Lewis, directed by Zoya Kachadurian, and now on stage at NJ Rep, is largely a memory play. Lissie and Billy always on stage (except for a few seconds to put crates of apples in the shed), but Roger only appears in brilliantly imagined flashbacks. For example, we see him as a young boy, comforting his terrified sister while their father is drunkenly shooting at random, as a teenager in Billy’s pickup truck riding back from a basketball game, and as a man enamored of Louis L’Amour’s novels taking a train to his new life as a cowboy. Richard Kent Green does a superb job throughout of acting Roger at every age, and would be recognizable as young Roger or adolescent Roger even without the costume signifiers (backward baseball cap or varsity jacket). Kersti Bryan and Christopher M. Smith are also fine re-enacting the younger versions of themselves, as they slip from the present moment into memories. I don’t think the revelation of the trauma that forced Lissie and Roger from their home will come as much of a surprise. The surprises lie more in the clever use of screen projection, the different ways that Roger and Lissie react to their dismal childhood, and the reveal of a marvelous prop on loan from Delicious Orchards. One little criticism: at one point Lissie takes a couple of bites out of an apple and then puts it back in the crate. She says she is planning to leave the orchard permanently and go back to her fourth grade teaching job as soon as she finishes picking the apples, so what is going to become of the crate? And what will the purchaser make of an apple with a bite out of it? Apple Season runs through Feb. 10. 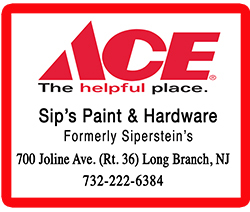 Regular performances are Thursdays and Fridays at 8 p.m.; Saturdays at 3 and 8 p.m.; and Sundays at 2 p.m. For tickets and more information, contact NJ Rep at 732-229-3166 or njrep.org.